User deletion is irreversible! By sending this request, your votes will be revoked, and all of your content will be made anonymous. Visit that page and read through the information there. Once you've done so, check the box to indicate that you understand the implications of deleting your profile and then click the Delete Profile button. 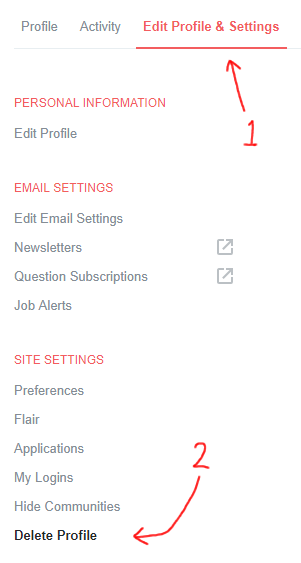 If you have never posted or voted more than once on your profile, it will be immediately deleted. Otherwise, you will be scheduled for deletion. During that time, you can cancel the deletion request by visiting your profile and clicking the cancel link in the banner at the top. Otherwise, it will be deleted after 24 hours.